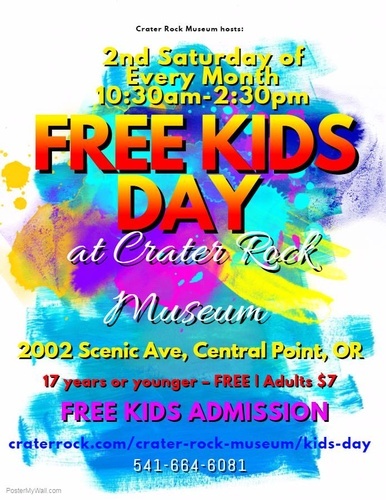 Kids Day is the second Saturday of every month. so mark your calendars. This is a special day that the museum sets aside to teach and expose children to the world of earth sciences, fossils, dinosaurs, and other really cool things we know they would like. There are free 20 minute classes that start on the half hour beginning at 10:30 am and continue with the last class at 2:30 pm. Afterwards, the whole family can explore the museum and all its wonderful displays. Take a stroll through the rock yard outside the workshop. If you find a rock on the ground, it’s only 25 cents a pound for everyone on Kids Day. In the bins, it’s $1.00. On days other than Kids Day, it’s 25 cents a pound for kids and $1.00 for adults. If you have any questions, please call 541-664-6081 during business hours. There are free 20 minute classes that start on the half hour beginning at 10:30 am and continue with the last class at 2:30 pm. Afterwards, the whole family can explore the museum and all its wonderful displays. Please call 541-664-6081 during business hours.